Notice the Caucasus Mountains, just east of the terminator, but still in sunlight. It seems that a lot of people like my lunar photos, taken with a plain Fuji S700/S5700 low-cost camera, and I get a lot of questions about how I do it. So I thought I’d write up a little blog entry here with the details. 1) In order to get maximum resolution from refractive optics (your lens, in other words) you want to operate at the highest F-number you can get. This means closing the lens aperture as far as you can. On my camera f-13.5 is as high as I can go. Your lens might offer f-16, f-22, or even f-32. If so, use the highest F-number you can. 2) The most attractive moon photos can be had when the moon is between a thin crescent and first-quarter or so because you will have nice sharp shadows on the surface of the moon. Everybody likes to shoot the full moon but a full moon has no shadows and looks pretty flat and boring. 3) Because we will use a high F-number, the required exposure time will range from around 1/40th of a second for a full moon up to 1/2 second or longer for a thin crescent moon so a tripod is a requirement. 4) Use the highest resolution your camera can do. Use ASA 100 film speed in order to minimize noise from the CCD. Set jpeg compression to the highest quality and largest image, or shoot raw. If your camera has a “sharpness” setting, set it for maximum sharpness. 5) Use a delayed release on the shutter because touching the camera causes the tripod to vibrate and it takes about a second or two for the vibrations to die out after you take your hands completely OFF the camera. Just because the camera’s display does not seem to show vibration does not mean there is none. Vibrations of 2 or 3 pixels amplitude are invisible on the LCD display. I use 2 seconds, gently press the shutter release and then remove my hands completely. I also sit absolutely still. I shoot from a wooden porch usually and if I move at all the camera will vibrate. Remember that you are trying to get every pixel sharp and so the SLIGHTEST vibration will blur the image. If the wind is blowing, forget it. If you have problems with vibration, try hanging a ten pound weight from the center post of the tripod. Many tripods are equipped with hooks for this purpose. This will cut down on vibrations a lot. Once you are ready, zoom in all the way, focus or set the lens to infinity focus, choose a trial exposure time, and see what you get. If the exposure is too dark or too light, change the shutter speed to compensate. Always leave the lens set to the highest F-number possible. Too dark is better than too light. You can brighten a dark image fairly well in post-processing (PhotoShop or whatever) but an overexposed blown out image is useless. Take numerous shots. Some will have vibrations that you did not perceive at the time. Bracket your shutter speeds. You might even bracket the focus if you are not sure of perfect focus. I usually take about 15 to 20 shots and hope that one or two will come out okay. 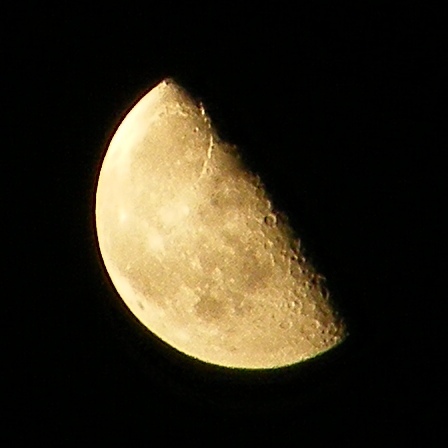 Lastly, crop the image so the moon dominates the photo and then you might try a bit of image enhancement. Use the “unsharp mask” function (Laplace transform) at very mild settings. Since you have likely cropped a 3,000 by 2,000 image down to 400 by 400, and you are going for fine details, use a small matrix. Many “unsharp mask” functions default to a 50×50 matrix and that’s way to big. Try a 4×4 or 5×5 matrix. Play with it and see if it makes it slightly better. Before and after “unsharp mask” enhancement.